The output gap represents the difference between the two measures of GDP – real and potential – in percentage term. This measure turned negative in Q1 of 2008 and it stayed below zero till the Q2 2017. 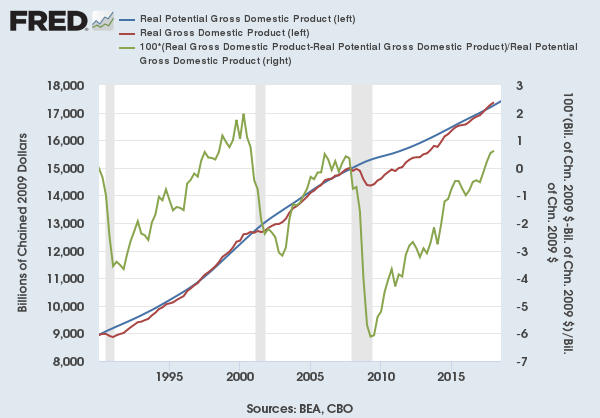 The Real potential GDP is the CBO’s estimate of the output the economy would produce with a high rate of use of its capital and labor resources. The data is adjusted to remove the effects of inflation. The positive value of output gap indicates that the economy is expanding and is running to its limit. Usually, in periods of over-utilization, the economy overheats and the inflation picks up.